SANRAL’s community project will improve mobility between two villages and enhance road safety. 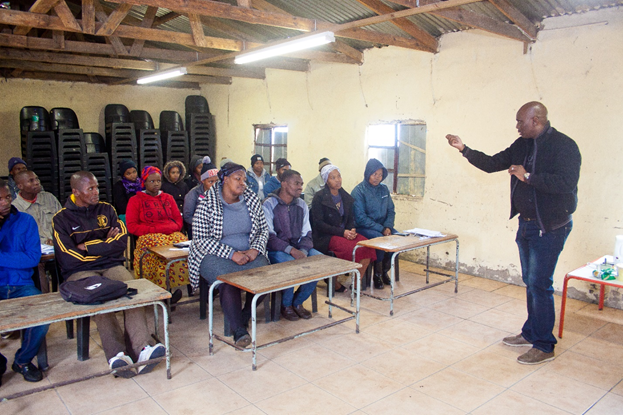 SANRAL stakeholder engagement manager Siphiwo Mike Mxhosa addressed participants during a workshop at Sigidi Junior Primary School, in August. The South African National Roads Agency (SOC) Limited (SANRAL) has rolled out a 24-month community development project in the Sigidi and Mahaha villages in the Eastern Cape. SANRAL has appointed a training service provider tasked primarily to train, mentor and develop “Learner Sub-contractors”. Following stakeholder consultation and a candidate selection process, 10 local learner SMMEs from the two villages have been appointed to construct a 10km access gravel road to a surfaced road. “Phase one of the project included classroom training, while phase two includes the construction of a 10km community access road. The 24-month training programme will provide a full learnership programme, accredited by the South African Qualifications Authority (SAQA), which will provide the National Qualifications Framework (NQF) level 2, 3, and 4 training,” said Duze. Theoretical training was held over a three-month period at the Sigidi Junior Primary School. Mbulelo Peterson, SANRAL Southern Region Manager, said: “We catered for 50% women-owned and 30% youth-owned SMMEs on this project. The majority of SMMEs are registered as CIDB level 1 CEPE, while two SMMEs are registered as CIDB Level 3 CEPE. We aim to have the CIDB Level 1CEPE SMMEs upgrade to level 3 CEPE once the project is completed. Peterson added that 10 FET college students would also assist SMMEs with financial administration and management while they work on the project. A Public Liaison Committee (PLC) and Public Liaison Officer (PLO) from both villages were appointed earlier this year. Mzandile Yebeni of Sophaphela General Trading is registered as a CIDB Level 1 CEPE. He is from Mahaha village and commutes 16km daily to and from classes. As a married man and father of seven children, he finds it difficult being unemployed and occasionally works in the catering industry. “Once I am finished working on this project, I hope to get work elsewhere on other projects. I would like to tender for other work at municipalities as well. I am happy to be part of this programme. I only have a matric and once I have completed my training, I will have an NQF qualification. Due to a lack of money I could not further my education. I have always liked the construction industry and look forward to JV with someone on a project,” said Yebeni. Nwabisa Dlamini of Sigidi Development is registered as a CIDB level 1 CEPE. Dlamini is from the village of village, is married and has two children. Before participating in the SANRAL project, Dlamini was self-employed farming sweet potatoes, mielies and other vegetables. “I used to sell my produce to markets to earn an income. Through this project I have gained knowledge on the construction industry and once completed I want to apply for other jobs on other projects. I am proud to be part of this course,” said Dlamini. Zanele Mbuthuma is a single mother to an 11-year-old son. Prior to working on the project, Mbuthuma was studying towards a Diploma in Education and Development. “My goal is to do a good job on this project. This will be good for the community,” said Mbuthuma.